Traditional school of thought tells us to just throw some form of synthetic lubricant (usually a white-lithium grease) on the piston rail inside the gearbox and be done with it. However, I'm a perfectionist and don't believe that the lubricant could be providing its maximum benefit if either the surface of the gearbox rails are fairly rough or the surface of the piston rails is rough. Or both. So, in conversing with one of my very good friends one day, we came upon this issue in our discussion and he suggested I try polishing the gearbox rails with my Dremel to really give them a nice clean and smooth surface for the piston to travel upon. He explained some of the things I've just explained and I was like, "Dang. That just makes too much sense." So I did as he told me, and within minutes, I had a cleaner, smoother and shinier surface upon my gearbox. Polishing your AEG's gearbox piston rails will allow faster cycling from less friction. 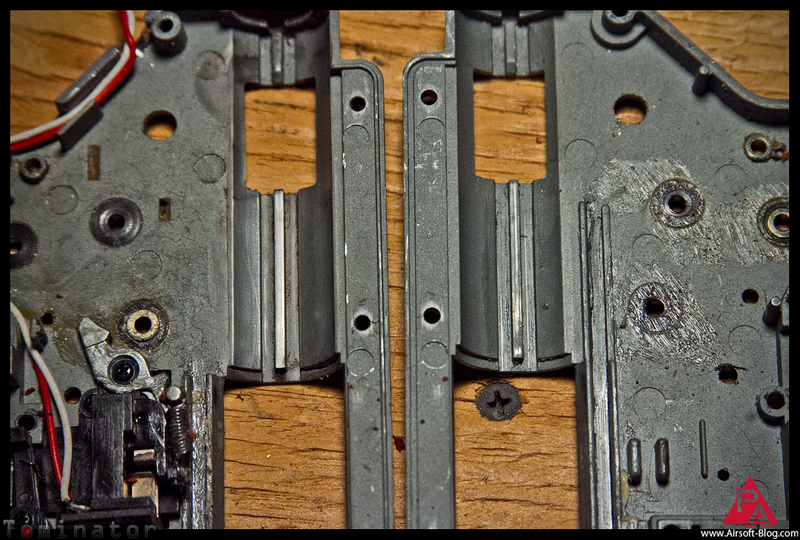 Polished rail on the left, unpolished rail on the right. If you view the enlarged photo above, you can compare the polished rail on the left side versus the unpolished rail on the right and notice at least some level of difference in the surfaces. The left one appears smoother and much more reflective in the light then the right side. I've also applied my Dremel's polishing bit to the concave sides of the gearbox that may also come in contact with the piston during its cycle. This shouldn't be happening very much if your gun is set up properly, but I figured, "What the heck? I've already got the Dremel fired up anyway." Dremel polishing compound, first applied to the wheel while it was spinning, then applied on the gearbox surfaces. You don't have to have a Dremel for this project. If you know what you're doing, you can probably acheive the same results using other methods of polishing as well (Google is your friend), but I used the Dremel because it's what I had available to me, not because anyone is endorsing me to do so. I basically started with a matte grey gearbox surface, with a bit of visible marks of wear & tear (as see on the rail of the right half of the gearbox in the photo above). I simply continued to apply the polishing wheel until the surface of the gearbox I was polishing appeared to take on more of a shiny aluminum surface, as if it were fresh out of the CNC machine. Since this gearbox is part of an ongoing project I'm still working on, I have yet to put it all back together to test because I'm still waiting for some other parts to arrive necessary for proper reassembly. But I think you get the idea at this point.